Silent Prayer is the solo project of Keat, the former guitarist of rap metal band Silent Prayer. This young artist manages to keep things simple. Nothing is overdone and the simplicity is one of the things that make his music so brilliant. 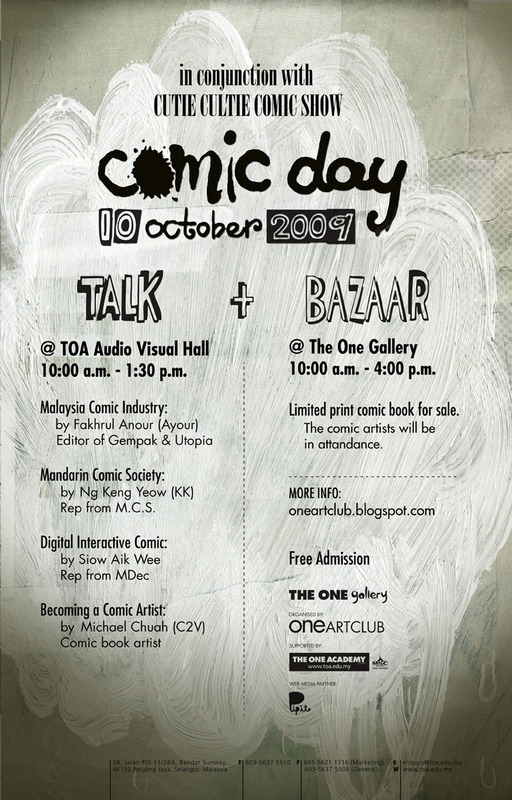 CCCS is a comic event created and organized by One Art Club. 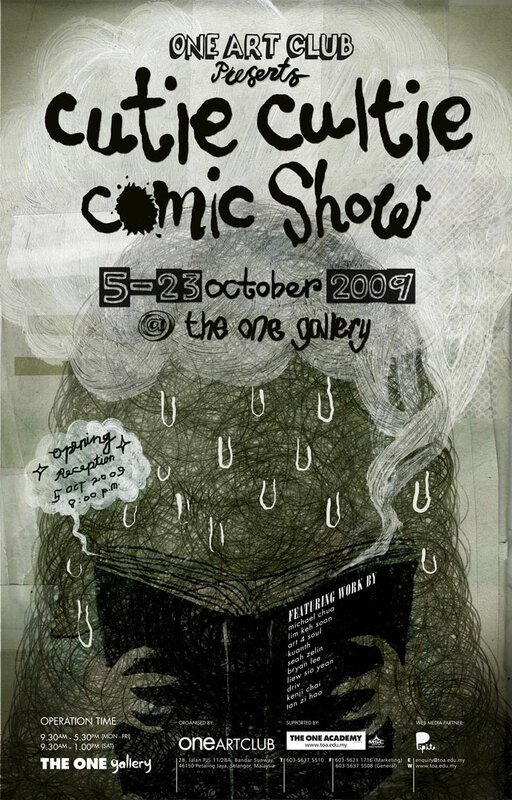 CCCS gathers Malaysian comic artists into one solid exhibition of comic art, featuring works exploring the world of cuteness, or what we call “Cutie Cultie”. It’s main objective-to provoke the imagination of the general public, students and in particular art enthusiasts into the world of comic art. 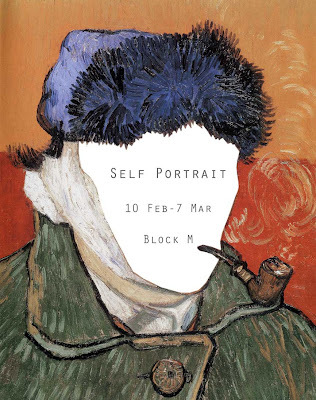 Opening Reception: 5 October / 8:00p.m. Wanna know more about Comic? Wait no more! Sign up for the Comic Workshop with Effendy and be a pro comicker in no time! Opened to TOA students from all majors, limited to 25 seats only. Email to sioyean@toa.edu.my to reserve your seats. once your seat is conformed, you’ll receive an CONFORMATION EMAIL from us. I would like to register myself for Comic Workshop from 19 (WED) – 21 (FRI) Aug 2009. If you've not heard of Pipit then you might have been living in a shell!!! Pipit is run by group of passionate people who loves art and initiate loads of events and projects to promote the awareness of Art in and out of Malaysia. 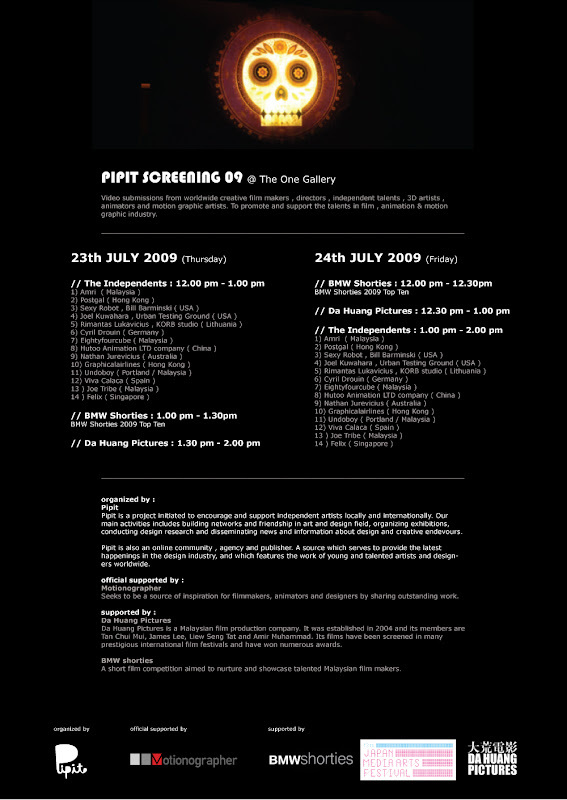 Now Pipit is having international and local video screening @ The One Gallery, do check it out! Born in 1972, Malaysian art maestro Kinsun (a.k.a. 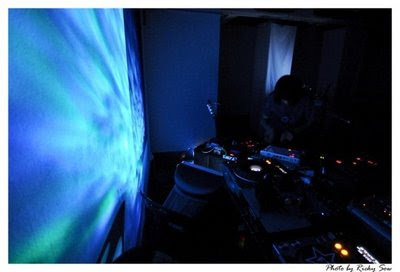 Kinsun Loh) initiates his burning passion for art since young. Soon after Kinsun graduated from The One Academy in 1994, he embarked on an inspiring journey in the bountiful world of comic and illustration art, where he shares his professional expertise with the masses both as a lecturer and academic advisor to enthusiastic learners. The One Academy principal Tatsun Hoi has even applauded him as ‘highly dynamic’ and an ‘all-rounded artist’, with endless flow of recognition poured in by the industry. Kinsun’s portfolio envelops his successful profession in the creative arena over the years including DC Comic Batman where his fine expertise was sought after, as well as becoming a comic illustrator for top-selling Hong Kong comic Storm Riders. An industry-savvy master brimmed with skills of traditional painting techniques, Kinsun ventures into the field of digital arts (CG). In 1996, he co-founded Sixth Creation, a creative studio that coaches, encourage and nurture the next generation of art apprentices, bridging creative minds and young artists together to fuel their dreams and mark even greater creative aspirations of the industry. Kinsun’s Journey to stART exhibition will feature over 50 out of his 300 renowned masterpieces that has charted the course of his 15-year career in professional illustration, along with high-quality illustration piece and concept painting resulted from the inception of Sixth Creation studio which bears clientele of local and international names, from Nike to leading mobile network DiGi. 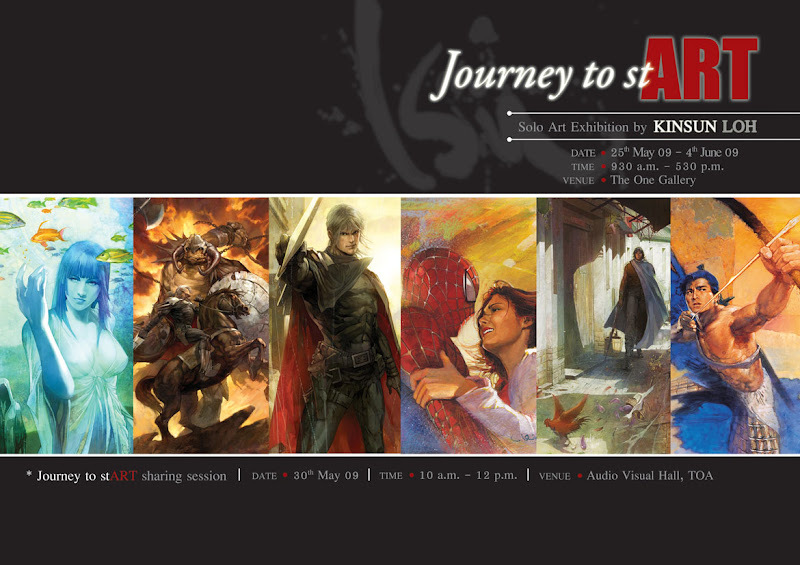 Witness the incredibly stunning CG artworks here by Kinsun, meet the illustration master himself at the sharing session where he will unveil his inspiration, concept and the creative process behind his masterpiece creation, and admire the rest at www.kinsun.net. 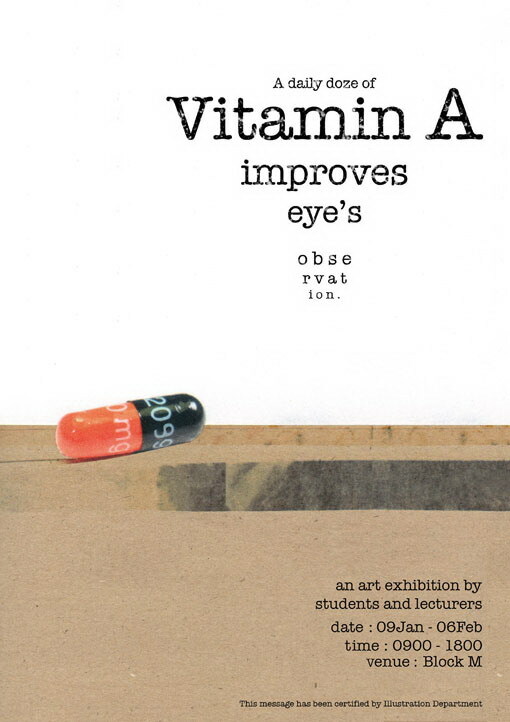 A daily doze of VITAMIN A improves eye's observation.